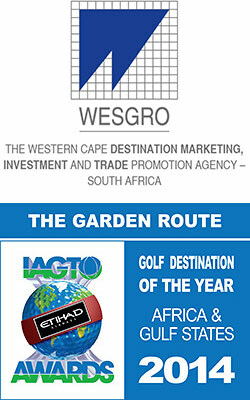 November 14 - The Western Cape’s natural paradise of the Garden Route has been recognised as the 2014 Golf Destination of the Year for Africa and the Gulf States by the global trade association of the golf tourism industry, IAGTO. Nils Flaatten, CEO of Wesgro, the Western Cape’s official tourism, trade and investment promotion agency, collected the award at the International Golf Travel Market (IGTM) in Spain on behalf of the province. Oubaai Golf Course is professional golfer Ernie Els' first signature course in South Africa, and George is where he resides when in the country. “The Garden Route is a very special place to me and definitely a golfing destination worthy of being the Golf Destination of the year,” said Els, who received an Honorary Award at IGTM. Also in George is the Fancourt Country Club, with three courses designed by Gary Player. “Low cost airline Mango has introduced a leisure schedule between Johannesburg and George - making this destination even more accessible to visitors. We will take this award to the people of the Garden Route on the inaugural flight from OR Tambo International on Monday, 18 November,” added Flaatten. The IAGTO Awards were established in 2000 to reward exceptional contributions to the world of golf travel. IAGTO’s 500+ golf tour operators from 61 different countries cast their votes for these Awards. Each operator was asked to nominate what they considered to be the best performing golf destinations this year enjoyed by their golf travelling clients. The golf destination in each of the five regions with most votes receives the 2014 Golf Destination of the Year accolade. Operators were asked to consider the following criteria: Customer satisfaction, quality of golf courses & accommodation, value for money, professional conduct of suppliers, support from the local tourism industry and accessibility to tee times.